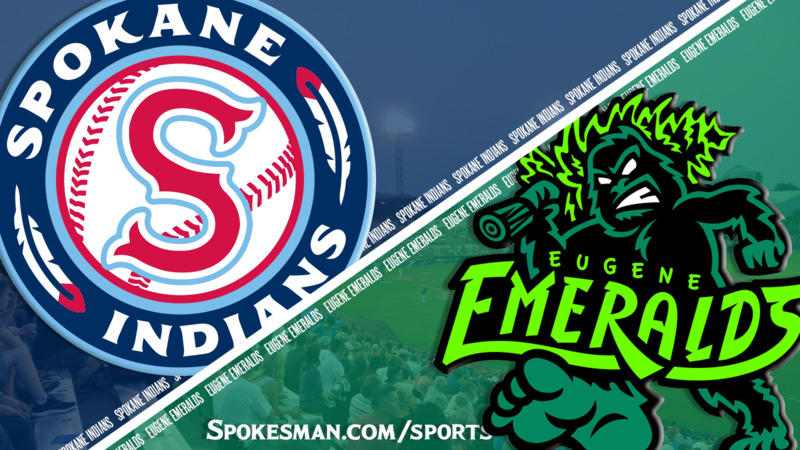 EUGENE – Diosbel Arias’ run-scoring single in the top of the ninth inning Wednesday completed a rally as the Spokane Indians edged the Eugene Emeralds 5-4 to open a Northwest League five-game series at PK Park. The outcome kept the Indians (6-3) in first place in the North Division second-half standings, one game ahead of the other three teams. The Indians trailed 3-0 when Curtis Terry started a three-run sixth with his league-leading 13th homer of the season. Troy Dixon added a two-run single to tie the game at 3. Eugene (3-6 second half) retook the lead in the bottom of the sixth when Gustavo Polanco scored from third base after a strikeout and wild pitch by Indians reliever Kyle Keith. Trailing 4-3, the Indians tied the game again on Tyler Depreta-Johnson’s sacrifice fly in the eighth. Arias’ winning single scored Hasuan Viera, who had walked. Werner Leal (2-3) earned the win with a hitless eighth inning. Sean Chandler picked up his second save, striking out two in the ninth. Spokane leads the season series 5-1. Published: Aug. 1, 2018, 10:44 p.m. Updated: Aug. 1, 2018, 10:48 p.m.